29 Dec 2014: Firefox was locked up this morning, probably because yesterday I was doing a lot of surfing. A window poped up asking if I wanted to stop this script from running but it required powering down my computer to get it running properly. I found an Avast web page that recommended getting Noscript & Adblock Plus for Firefox and have installed them. This is an email protocol introduced in 2012 that allows checking the validity of the "from:" address. I has broken a number of list servers, but as of Aug. 2014 that's starting to get fixed. What's needed is a similar protocol for telephone calls to stop spam calls. For short runs between the Hub and Computers - off the shelf CAT5 RJ-45 cables with either T568A or T568B wiring will work fine. Note that for 100Base-T all 4 pairs are required. Spool of CAT5 cable. Typical size is 1000'. The cable has a printed footage count and the first number should be written on the box to help you know how much you are pulling. There are 4 pairs in the cable with color coding consisting of 4 solid colors (Orange, Blue, Green and Brown) and the same colors with a white stripe. Common single switch (or socket) type electtical box with 2 screw holes on the vertical center line 3 1/4" apart. This is the standard hole pattern for a house wall switch or duplex socket. For adding the box after the wallboard is already installed you can get boxes that have ears that rotate behind the wall board and do not need to be located next to a stud. One to Six Jacks depending on the number of places the face plate supports. 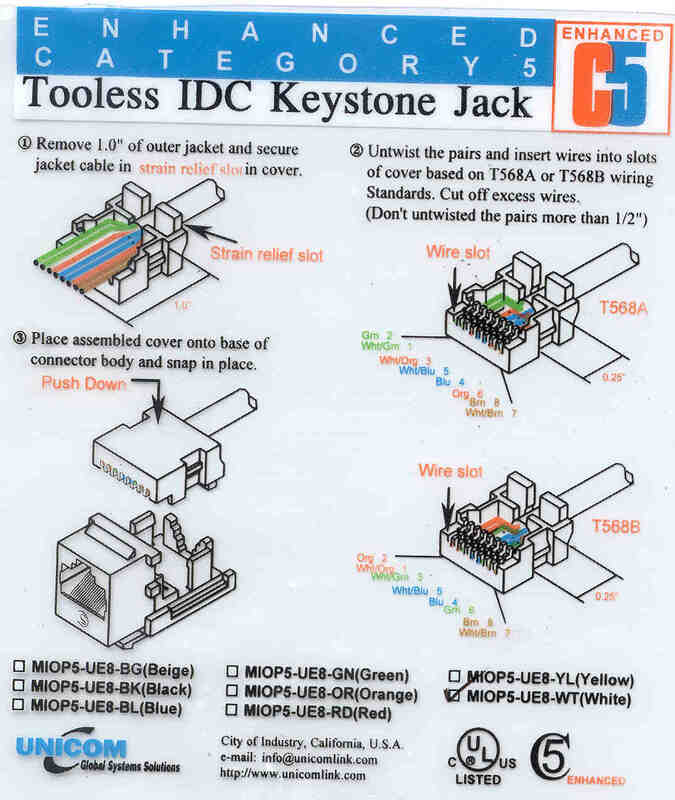 Note that the jacks can be chosen from a list that includes phone jacks, BNC(f) LAN jack or a fiber optic connection. The jack wiring is not in T-568A/B order because there are 2 rows of IDC contacts, you need to follow the color code on the jack. 8P8C - Eight Position Eight Contact plugs (RJ-45 plugs) come in various size bags. I got a bag of 50 each. These do NOT fit sockets before the contacts are crimped onto the cable wires. There are 8*7*6*5*4*3*2*1 ways to wire a plug but only 4*3*2*1*2 will work and only 2 of these are standards. More information is at World of Windows Networking. The colors of both will be the same. For T568B they will be: w/O, O, w/G, Bl, w/Bl, G, w/Br, Br. If the two left colors on a plug are Green you have a T568A. Note that both the T568A and T568B work exactly the same, the only difference is which pairs are assigned to what pins. Note that the "Space Shuttle Verified" 3' cable that I got at Fry's has the T568B colors above but is labeled "EIA/TIA-568A", so you see the A or B does not make any difference. Crimp Tool for installing the 8P8C plugs. These are available in cheap and professional versions. I got the Ideal "Telemaster Crimp Tool" Cat. No. 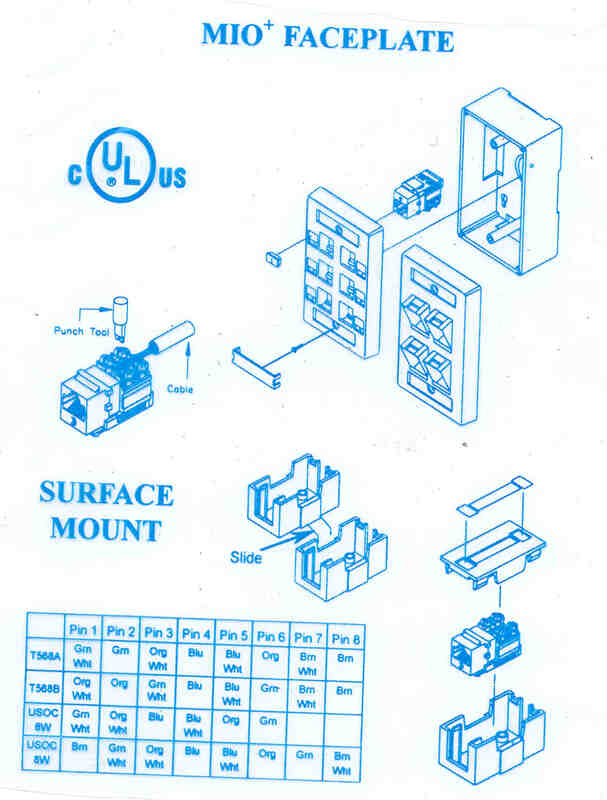 30-496 that is for RJ-11 (2, 4, or 6 position) [standard telephone line connectors] and RJ-45 (8 position plugs) for networks. This model will cut cable, strip it (short or long stops built-in) and crimp either 2 through 6 positions or in a separate hole 8 positions. If when using the stripper function the handles are closed tightly, the insulation on the wires may be nicked or a wire may be cut. It's best to only very lightly nick the outer sheath and then pull it off by hand. In order to route the CAT5 cable through walls you can get an alarm installer's long drill bit. These come up to 72" long and have a hole in the point of the bit so that after the drill is through you can attach a lead pull and as the drill is pulled our of the hole it pulls the lead out. Then the cable and be attached to the lead and pulled back. There are a lot of gimmicks to aid in installing cable after a building has been built. See Mike Sandman's web page for more on this topic. This comes with the NIC cards. I had some trouble getting the FA310tx driver to stick. The 24 hour support line at Netgear helped solve what turned out to be dirty connectors on the card. This phone support is a very valuable thing to have when setting up networks. NetBEUI - This is the simplest to use in a peer to peer network like what I am doing here. If a separate server computer is being used then TCP/IP or some other protocol will be used. In my case the Sony must be configured with TCP/IPfor my work usage. I also prefer TCP/IP because LabVIEW has features that support TCP/IP. BOTH NetBEUI and TCP/IP can be installed at the same time. I needed to install NetBEUI on the laptop and desktop machines so that I can see the old 486 in the garage. As of 3/12/00 I have three computers all talking to each other! 192.168.0.1 with a subnet mask of 255.255.255.0 on the laptop and 192.168.0.2, with the same subnet mask on my desktop. This book has the basics but you will need the Netgear 24/7 phone support or an equavilent quality phone support system to get the network up and running. This is a product made by Quantum. It is a box containing 1, 2 or 4 drives (the first digit of their model number is the number of drives). The model 2000 can be configured for RAID level 0 (one big drive) or RAID level 1 (2 drives that are mirrored). Miroring gives full redundance, or backup. The model 4000 can be configured for AID levels 0, 1 or 5. With level 5 you get full backup but only loose one drive or about 25% instead of loosing 50% as in a two drive setup. My concern is that the disk drive business is very high technology. In a couple of years the drives in the Network Attached Server (NAS) should be replaced with ones with more capacity, faster and lower cost. Can this be done line in a PC, or are the drives customized with firmware for this application. The early (high performance and price) RAID systems were high end, used Ultra wide-fast SCSI and were mounted in a box sererate from the computer. Since SCSI is supported on many types of computers (not just the PC) it is a univrsal solution. A newer version of RAID is is a PCI card that connects to disk drives in a PC. This is a much more affordable solution and offers all of the advantages of RAID - Speed and real time redundancy. [an error occurred while processing this directive] page created 8 March. 2000.